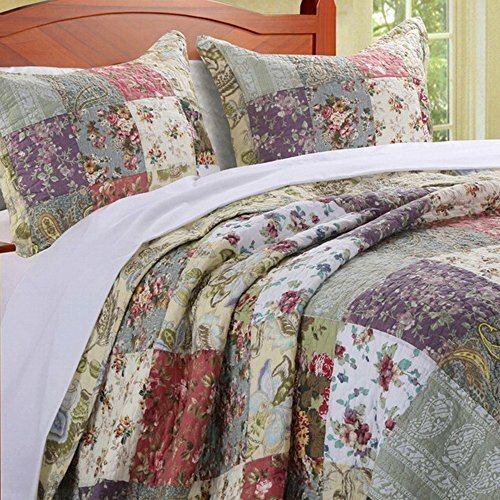 Size:King * Add elegance and warmth to your bedroom with this unique Cottage Garden theme decor bedding. Wrap yourself in Super Soft Cotton for the ultimate Comfort. Amazing quality bedding! Stunning timeless pattern! 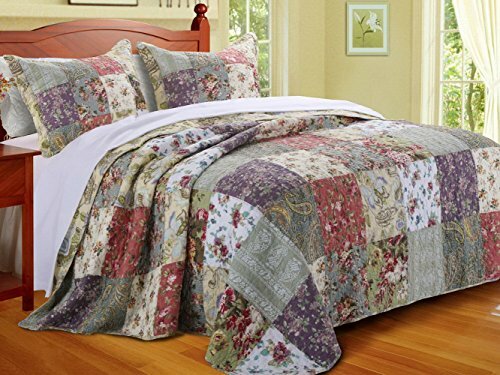 * Luxury Chic Vintage Cottage style bedding 100-percent Cotton Reversible 3-Piece Oversized King Quilt Bedspread Set with coordinating Pillow Shams. 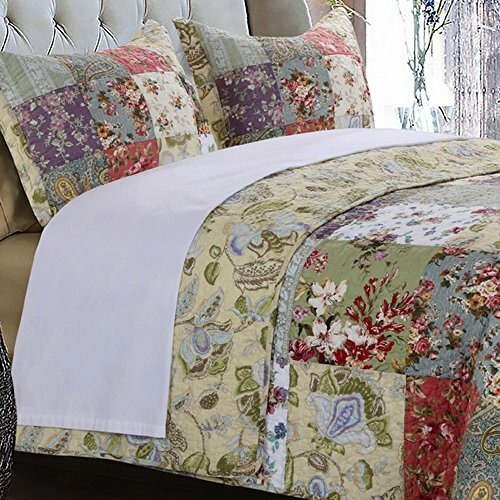 The mix of the Rich and Vibrant colors will make this bedding set the focus point of your bedroom. 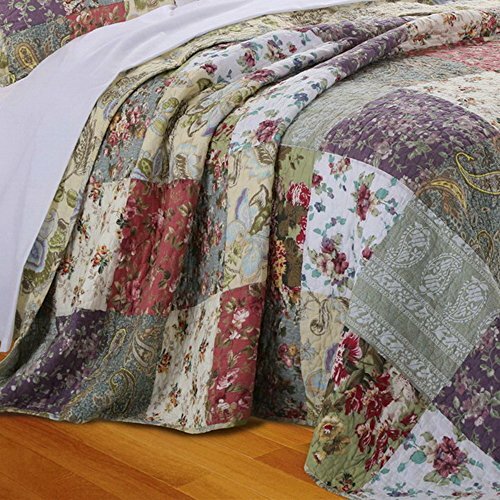 * This elegant Country Cottage inspired Quilt Bedspread comforter Set features a Patchwork design with a charming Garden Floral pattern in rich tones of warm and deep Blues, Greens, Lavender, Coral, Rose, Ivory and White. It is completely Reversible to a coordinating Jacobean Floral Paisley pattern on a soft Yellow background to match any neutral bedroom decor. Just flip the bedding set to get a whole New Look in seconds. * Beautifully designed Vermicelli stitching pattern for elegance and texture. Machine quilted with fabric bound edges for durability. 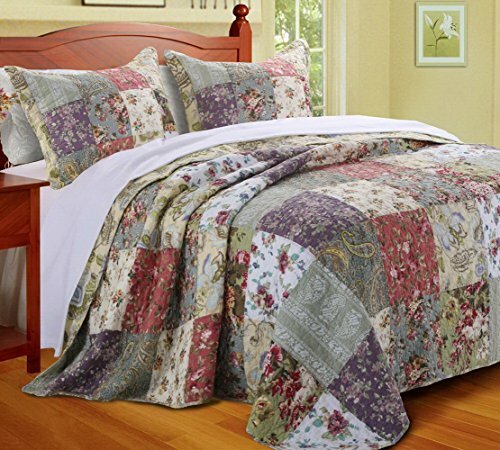 You can't go wrong with this luxury quilt set as it will go with almost all bedroom decor. 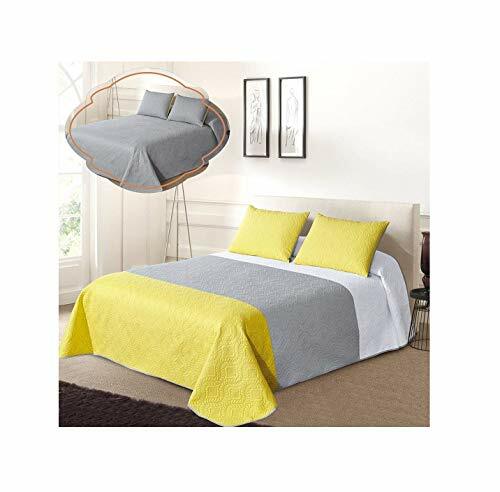 * The Oversized bedding set goes to the floor and doesn't need a bed skirt like a regular quilt set. * The unique simple pattern is the perfect bedding choice for Couples, Women bedroom for a masculine or feminine look. The luxury bedding set would make the perfect gift for any occasion as Mother's Day, Wedding, Birthday, Anniversary. * Satisfaction 100% guarantee: Risk free shopping! You are covered by our 30 day return, no question ask If you are unsatisfied, simply contact us. 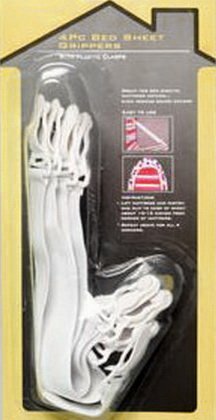 * Includes: 1 package 4 piece Bed Sheet Straps Grippers: they secure and hold in place fitted sheets, flat sheets, mattress pads, and even ironing board covers (will arrive by mail in a separate shipment).